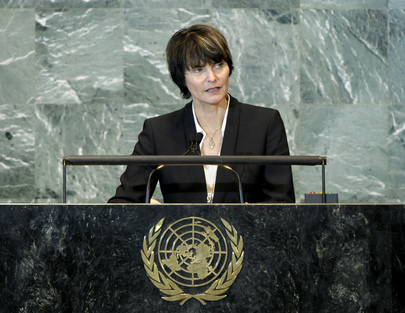 MICHELINE CALMY-REY, President of Switzerland, opened her statement with a call for equity and a series of questions. She asked: What development policies should be shaped so that all could benefit? Why were the poorest countries benefiting so relatively little from globalization and what could be done to change that? What did the words equality and social justice mean in the twenty-first century? As examples of the modern world’s deep inequality, she noted that Switzerland’s GDP was 130 times that of Mozambique, and that one quarter of the world’s population consumed three quarters of available raw materials. She said that with the world’s population set to shortly cross the 7 billion mark, the international community must find some way to ensure that there would be sufficient and affordable food, water and energy for everyone. “It is up to us to find the answers,” she said. That called for a sense of responsibility and a readiness to reflect together on norms, values and priorities. It also required a readiness to fight for global social justice. The United Nations was the Organization most and best equipped to support such an effort. However, she cautioned that with global governance so fragmented and inefficient, for the United Nations to succeed, the structures of governance must be strengthened. The events in the Arab world were a reminder that “democracy is the twin sister of sustainability”, she said. Ultimately, it was the lack of political freedom combined with social injustice and poor economic prospects that had driven the fundamental changes in the Arab world. Many nations were now facing difficult transitions and must also face the fact that relations among States and regions, and between regions and the world, should be based on new principles. “That is the challenge facing the countries concerned and the new social groups that have taken the lead in bringing about change — youth, women, emerging middle classes, and civil society,” she said. It was also a challenge for the wider United Nations. Indeed, the international community must do its best to ensure that the victims of unrest and violence were helped quickly and effectively. That meant committing to strengthening security and the rule of law, as well as promoting national reconciliation and legitimate efforts to create new constitutions. Help must also be directed at protecting the human rights of all. She noted with regret that the spirit of optimism generated by the “Arab Spring” had not breathed new life into the Middle East Peace process. Following United States President Obama’s address last year, “for a few minutes, we dreamed” of peace between Palestine and Israel. Yet today, all looked with bitterness at the bleak horizon, darkened by “lead-footed progress, stagnation and hardened positions”. Indeed, it appeared that after 60 years, the “peace process” had replaced peace. Nevertheless, influential parties on both sides continued to work to unblock the stalemate. Indeed, she recalled that the Geneva Initiative was a “consolidated, detailed proposal”, compatible with internationally acceptable parameters, including the Arab Peace Initiative. It remained at the disposal of the relevant decision makers, as well as of the populations whose right it was to demand peace. Recalling the central principle of preventing future wars, she stressed that if the Security Council was to play its rightful role to that end, it must be adapted to modern political realities. “I would like to see a Security Council that is more open and transparent and more accountable to Member States”, she said, adding that the 15-member body’s decisions affected all States and were legally binding. As such, Switzerland was working with its partners in the “Small Five” group to improve its working methods. She also noted that the United Nations could only improve its functioning when countries insisting on a greater say in decision-making revealed themselves to be ready to accept greater responsibility for such proper functioning.